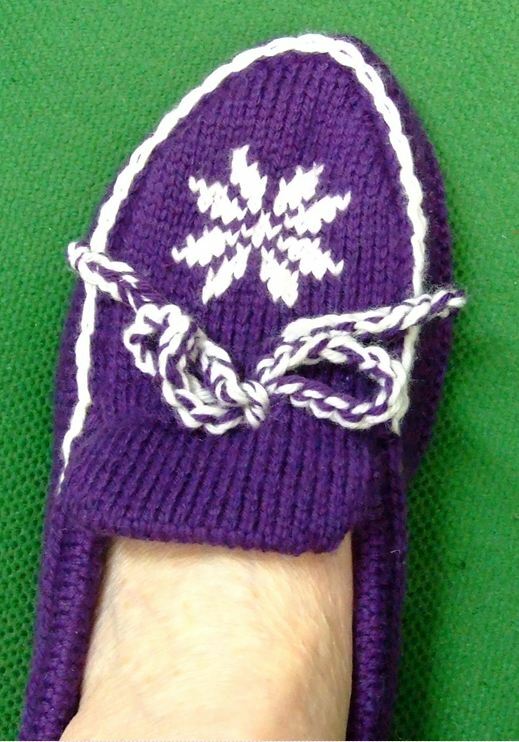 Last night I finished my newly designed Moccasin slipper, and I was anxious to share it with you, so I have uploaded the pictures below. I hope you like the design. As I mentioned in the last couple of posts, this project was constructed using the Twine knitting technique and shaped with short rows. Here is a closer look at the upper toe section of the pattern. I have knitted a casing around the back and sides, which aligns with the casing I designed in the instep flap. A 24 inch crocheted chain of both colors cinches the Moccasin in for a perfect fit. 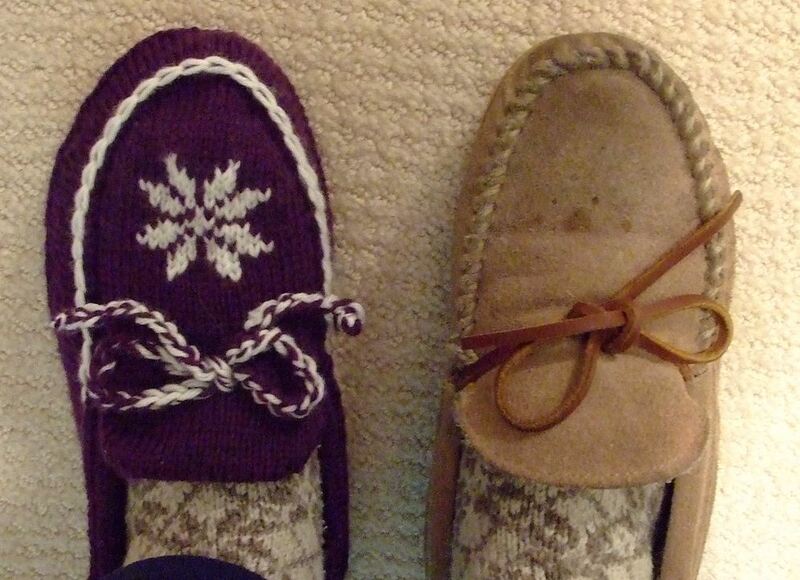 The slipper on the right was my original pattern. It is enough to say that I am pleased with the results of my labors. I will be ordering the yarn for the second one, as this creation was done out of my stash (my play around yarn). I am planning on knitting snowflake knee socks to match. I might even put them together. Where I live it gets cold in the winter, and a extra Thermo layer would be nice. As you can see the side chain, which can be done with a crochet hook or can be stitch as a embroidery chain stitch, pulls it all together. This has been a fun project. The other day I was working on an idea for a new Mocassin slipper. After turning over the one I was wearing, I decided to try and duplicate the shape of the sole. How? With short rows. Dividing the sole shape lengthwise, I charted the short rows to achieve the upper half which ends at the toe edge. Next, I flipped my chart and designed the other half, ending the final row at the back of the heel. 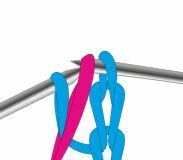 If you will notice there is a blue line of loops down the center; that is the provisional cast on row. Once the first half is finished, the provisional chain is released and the stitches are picked up to complete the second half. Below is the result of my playing around. The finishing round of this part of the slipper was a purl row, as it made a clean transition before starting the short row shaping for the sides. After working about 5 even rounds, I marked off the front tow section and began to shape the back part of the slipper sides with short rows. 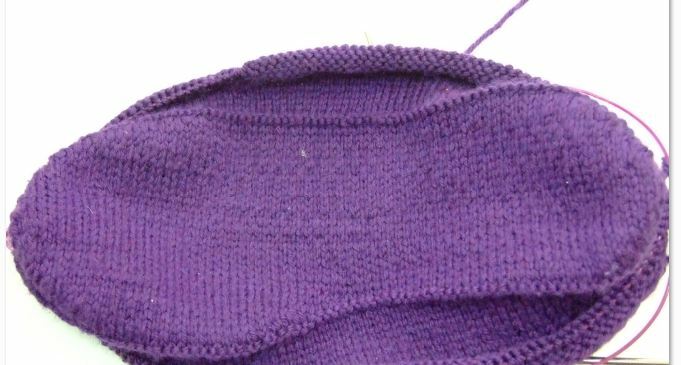 Once the short rows were complete, I closed the gaps, continued around to the toe section and ,decreased stitches at the front to create a much nicer fit. The next section will be the top of the toe and a flap that lays up on to the instep. I am thinking about doing a Fair Isle design for that. Humm???????? It was during the process of creating the flap for my toe section that I decided to share the process I used . This double layered(or lined) flap is knitted with straight sides, and single and double stitch portions to form the shape. I have completed a tutorial with written instructions as well as a chart. The idea is to get you imaginations going. Short rows are not limited to sock heels, shoulder seams, and sleeve cap shaping. This tutorial is a swatch practice that I hope will help you feel more comfortable with closing all sorts of short row gaps. Below is a result of repeating the chart three times on the same original cast on. I feel a hand puppet coming on!!!!!! 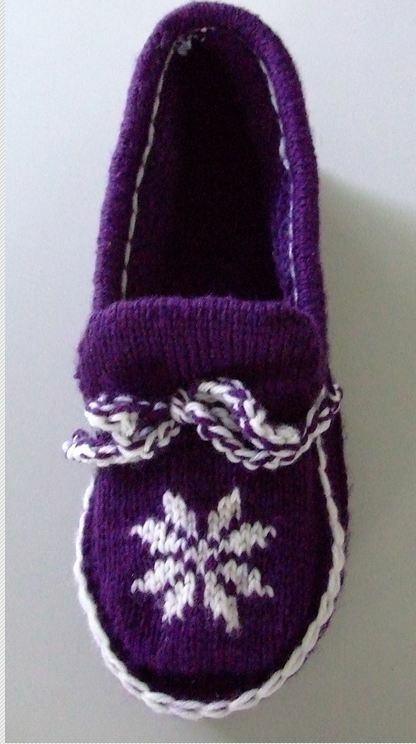 PS: I will be uploading the slipper pattern when its finished. This morning I added a PDF that might help you understand the way I design these short rows-at least I hope it does. 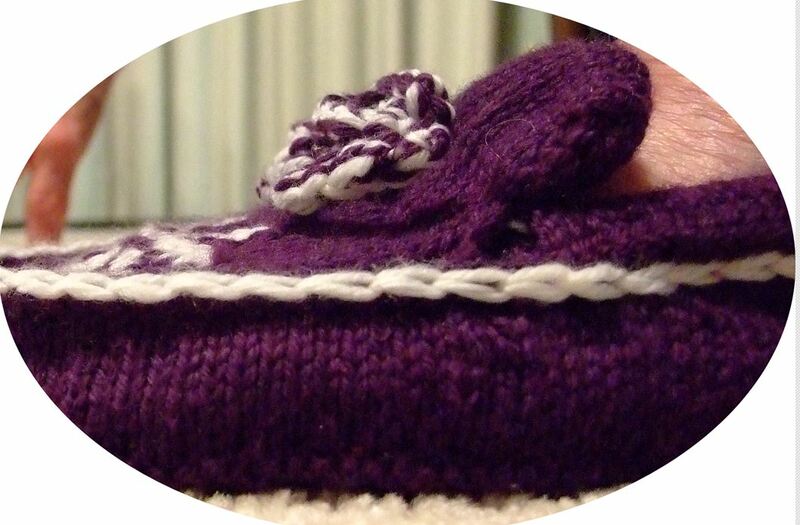 Since I learned how to make the short row heel, with all its variations, I have been fascinated with the concept. It is not at all unusual for someone to find me casting on a number of stitches on to a DPN, to try out a new idea on how to use them. Recently I have been charting my short row shapes, which gives me a clearer picture of the end product, and the opportunity to change the stitch groupings as needed to get the desired affect I want. Even though the chart clip is small, viewing it from the bottom up, you can see the angle of each side. 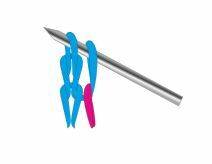 This chart leaves a pair of stitches on the needle with each turn. Rows 7 and 8, close the gaps and complete the shape. 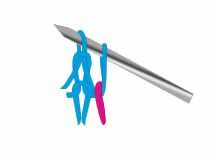 In this chart, groupings of three stitches are left on each end before the turn, thus changing the angle of ascent. In the chart above, I have combined groups of 2,3 and 4 stitches to create a more rounded shape. Here, rows 9-10 close the gaps and complete the shapes. The possibilities are endless. How do I close my gaps? I pick up the stitch that looks like a “collar” around the slipped stitch of the previous row, place it on the left needle, and knit or purl it together with the slipped stitch. Above, is an illustration of how it looks after you turn, slip one stitch and knit the next. I have highlighted the “collar” in pink. You will notice that is actually is the stitch below the slipped stitch that forms this “collar.” You will also notice that it leans slightly toward the left, as it is being pulled over with the slipped stitch. 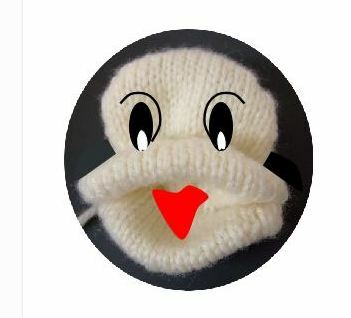 This illustration shows you the slipped stitch turn on the purl side. Here again, the stitch(collar) leans to the left a bit. I haven’t made a video of this yet, but Cat Bourdhi has, in her Sweet Tomato heel demo on YouTube. But that aside, I have drawn some illustrations to make my point. 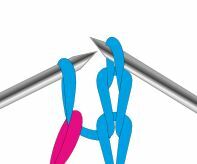 When you have a “collar” (pink) around the stitch just before the gap as in the illustration above, you lift the “collar” (pink) up and onto the left needle, then knit it together with the slipped stitch. This process closes the gap. From here you can knit the next stitch or stitches of the next grouping until you come to the next “stitch collar.” This works the same on the purl side as well. You will find it is a very smooth transition. Another advantage of experimenting with the various stitch groupings is that you can shape your toe caps (see my More Toes Tutorial) as desired. 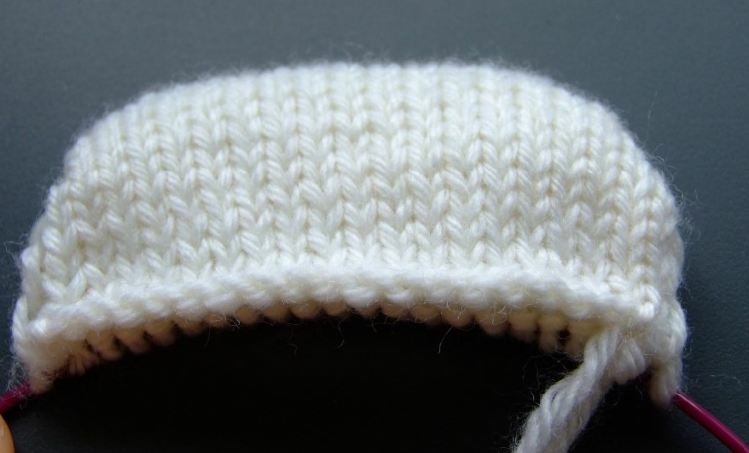 You can combine the various groupings with the single stitch turns normally used in the short row heel ( a 90 degree turn) to finish the cap before picking up your stitches off the provisional cast on to start knitting in the round. For those of you who already use my method of short row heel, you will recognize this as the SPR. The only difference is that you are lifting the loop and knitting or purling it with the loop to its immediate left (the slipped st). I will soon be posting the complete tutorial as a PDF. So check back soon. In the meantime, try some different shapes of your own. Also don’t forget to check out the “Sweet Tomato Heel” tutorial on YouTube. Now that I have completely confused you , I bid you happy knitting!